“Active transportation” is a means of getting around that is powered by human energy, primarily walking and bicycling, using a wheelchair, or traveling to public transit. Making active transportation safe and convenient meets a critical need in our communities that benefits everyone. Active Transportation helps us to be healthier by being more physically active and having cleaner air to breathe. Families are better able to manage the cost of driving. Motorists benefit from less road congestion. Our neighbors without a vehicle are able to travel to work, shopping, and doctor appointments more safely and easily. Be Healthy Berrien is working to support active transportation networks across the county. Our partners across the county are teaming up to promote safe, convenient active transportation for all. 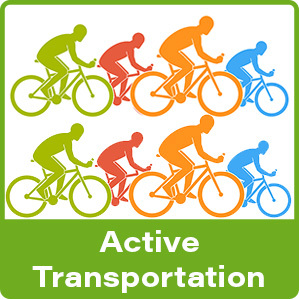 If you would like to get involved in the Active Transportation Team, please contact us! My Way There is a tool that helps people consider many different ways to get around Southwest Michigan, overcome transportation barriers and get to the places they need to go. My Way There will help you find a ride, find public transit, find mobility resources and more. The National Complete Streets Coalition, which launched this movement in 2004, promotes the development and implementation of Complete Streets policies and professional practices. To date, over 730 agencies at the local, regional, and state levels have adopted Complete Streets policies, totaling over 950 policies nationwide.